It takes time to understand the many quick-deployment avalanche airbag backpack systems on the market. Just understand one thing, have one. For us, we don’t care about the brand, but get one, become familiar with it and wear it. Avalanche airbag backpacks are hotly debated in the blogosphere and in every pickup towing a mountain sled to a honey hole. The debates focus on purchase price, mostly, and which airbag is best, wings, vertical bag, or halo style; and the deployment method, compressed air, C02, or a battery-powered high speed fan. All talkers in the pickup though will agree, having one is more important than brand. An avalanche airbag backpack is only part of a sturdy four-legged chair: leg one, avalanche rescue beacon/transmitter; leg two, rescue probe; leg three, aluminum or steel rescue shovel; and leg four, the avalanche airbag backpack. Legs one, two and three are rescue directed, whereas leg four is preventative. We use the term “preventative” generically, as the best preventative measure is avalanche knowledge – the skill, training and practice. Know what you need to know, know it better, train on the knowledge, practice the practical and be aware and alert when boondocking. We’ve also come to rely on a good radio for our two-way communication medium; radios are important to our backcountry, and we highly recommend one, such as BCA’s lithium-ion battery equipped “BC Link” with “Smart Mic” which we use religiously. We’ve heard so many times here in the West, when a dedicated steep-n-deep player dies in an avalanche, “At least he/she died doing what they love.” That which you love should not kill you. Period! 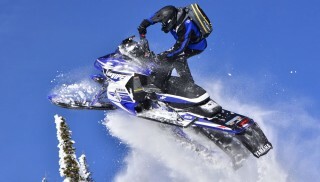 Here for your knowledge base is some quick technical information on several quick-deployment avalanche airbag backpacks that snowmobilers use. Let’s get to it. Although Motor Fist is widely known for its functional outerwear, it is about safety as well. 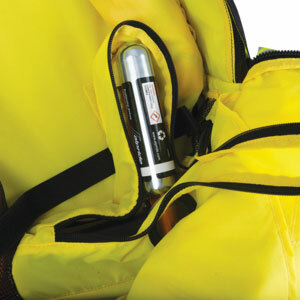 With its vast line and knowledge, Motor First has brought to the market a quick deployment avy bag that relies on a replaceable C02 cartridge and Argon cartridge for its inflator and volume discharge system. Motor Fist’s Argo Avalanche Airbag Backpack is a dual cartridge system with one cartridge filled with CO2, which is the volume cartridge, and the other cartridge filled with Argon as the quick burst launch-to-inflate. Both are replaceable cartridges. Argo avalanche backpack owners can carry with them an extra set of cartridges. Like a C02 inflator for a road bicycle or mountain bike, these cartridges, once used, are throw away cartridges. With a second set on hand (owner’s responsibility to purchase a second set, as the Argo bag comes complete with the first set in the purchase price) reinsert the second set into the Argo bag and you are good to go. When we heard this, we were like “whoa, that can’t be.” Well, it is; it is that simple. 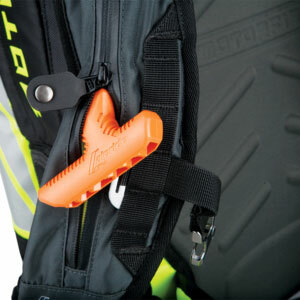 The Argo avy backpack has a venture valve for additional volume, which ensures the air bags fully inflate. 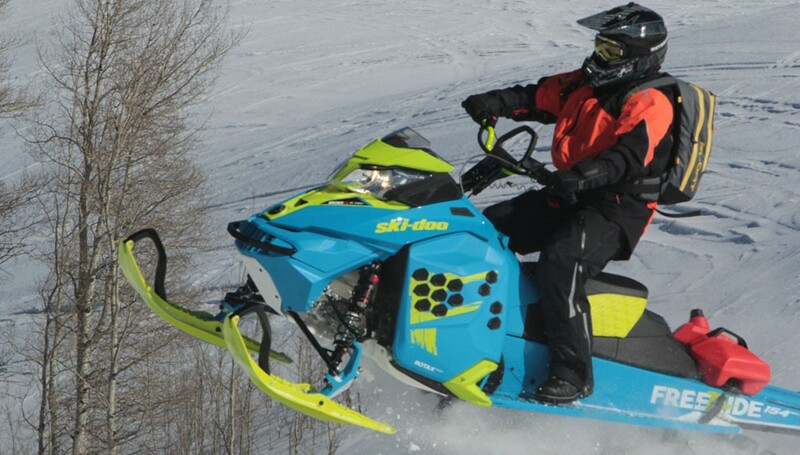 This is snowmobiler specific air bag where the launch trigger can be set to either the left shoulder strap (for right hand pull) or right shoulder strap (for left hand pull). The Argo bag is hydration (hydro bladder) compatible and has integrated pockets for a pair of goggles, a rescue shovel and probe. Motor Fist has loaned us an Argo bag, and we will put it to the test. Not that we will go out and set off an avalanche on a buddy to see if his or her life will be spared, but to test its storage, comfort and peace-of-mind that we have an avy bag. If we use it, in its pure element, to save our life or the life of a guest-test rider, then that too will come to print. The price for this bag is it at US$639.99. An extra set of cartridges is US$39.99, which is not bad. 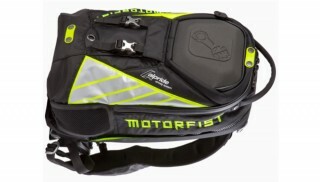 For more information, go to www.motorfist.com. Klim – always on the edge, always delivering safety – is not a company that dumps products on the market because it can. This company delivers what it has tested, depends on and uses for its own safety. Take Klim communications guy, Stephen Clark, who is a new father with new additions on the way; he would not jeopardize his role as father and husband to a second-rate avy bag. Given that, the PIEPS Jet Force avy bag that Klim sells, not as the only distributor, but as essential personal protective equipment to complement Klim’s already stellar line of outerwear. 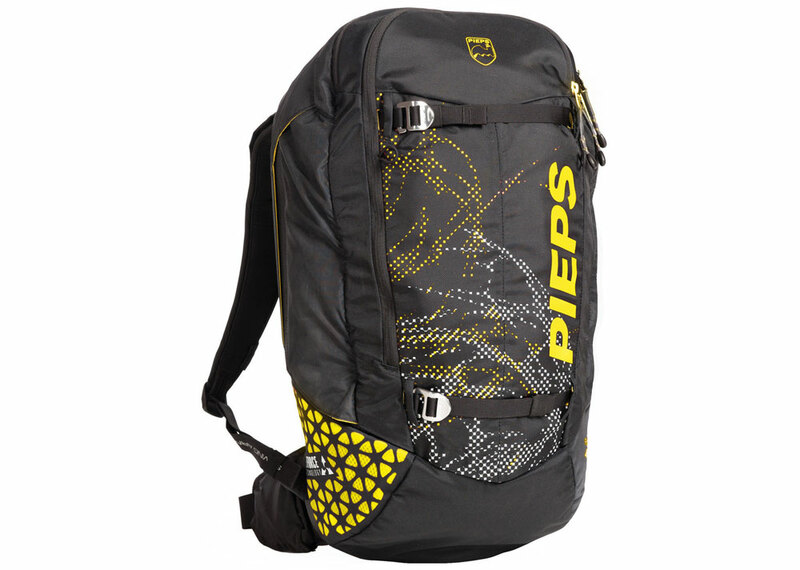 The PIEPS JetForce is the first avy airbag with electronic jet-fan technology. This fan only needs ambient air for inflation. JetForce is the result of the collaboration between PIEPS and Black Diamond, two leading innovators in snow safety. The travel-friendly and compact Lithium-ion battery supports four or more deployments. The airbag is easy to inflate and repack for several deployments or for practice. The airbag automatically deflates after three minutes. In case of emergency the pressure on the buried person is reduced and air pocket has a volume of 200 liters. The 24-liter bag retails for US$1,029.95, whereas the 10-liter bag is priced at US$999.95. PIEPS / Black Diamond have all the avalanche rescue and preventative equipment you will need, from probes to transmitters/receivers and shovels, and non-avy bag backpacks. For more information, go to www.Klim.com or www.pieps.com. BCA has nine avalanche airbag backpacks to choose from. These nine bags are called “Float” and are differentiated by size, such as “Float 22,” which sets this Float bag as a 22-liter bag. Other liter-volume sizes include an 8, 25, 32 and 42. One Float bag is an avalanche bag only with zero storage, and one bag has an integrated chest protector, to be worn on the outside of one’s parka/coat. This Float called the “MTNPRO” vest and is a 12-liter volume vest. 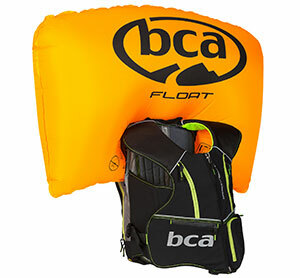 For us, we use the BCA Float, as BCA has been patient with our nits and groans, taking our input and building an avy bag that we depend on. But, we would depend on the other avy bags as much as we depend on the BCA Float. Given that, here are the specifics to the Float avy bag. The Float 32, which we use, has an integrated BC Link radio system. All Float avy bags rely on compressed air as its discharge system. The compressed bottles, not filled, are sold separately by BCA; be on the know, when purchasing the avy bag from BCA or a dealer, ask for and purchase the refillable bottle. All BCA compressed air bottles are reusable and must be, according to BCA, recharged at an authorized refill location, such as a SCUBA gear shop. BCA has available seal kits that will ensure a bottle to inflator seal. These are needed when recharging the bottle. The BCA bags, depending on volume, will have ample room for probe, shovel and an extra pair of goggles housed in a fleece-lined pocket. The pull handle is mounted on the right shoulder to be pulled by the left hand to keep the throttle hand busy squeezing the get-outta-here lever. BCA is a complete shop, which we tap in to. We rely on BCA’s probes, shovel, and transmitters/receivers and its online tutorials and product to keep us safe and rescue-smart. The nine different bags start at US$199.95 and move up to US$799.95. 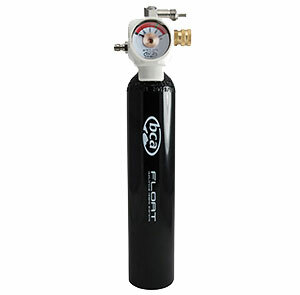 The Float compressed-air bottle, which you will need, retails for US$175.00. Cost to charge the bottle ranges from $8.00, $12.00 and $20.00. For more information on BCA’s products and its vast avalanche material, go to www.backcountryaccess.com. Avalanche safety gear is an adjunct to knowledge. It is imperative to have deep avalanche training. 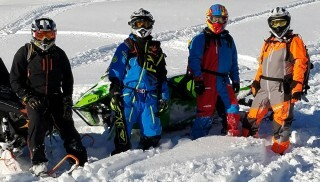 Ski-Doo offers free to the public avalanche awareness classes; go to Ski-Doo’s website to verify schedule dates and times. Usually these are around the snow-show season. These are good classes that give a solid foundation to build on. More advanced training is available from Mike Duffy (www.Avalanche1.com). Additionally, online interactive training is available through Backcountry Ascender at www.backcountryascender.com. We encourage you to search “Avalanche” or “Avalanche Awareness” in Snowmobile.com’s search window and start, or continue, building your avalanche knowledge trove.